Late one night this spring, Mr Justin Snider, an assistant dean at Columbia University, was riding a train uptown in Manhattan when it ground to a halt. After about 15 minutes - with little information about the delay and no cell service - everyone in the car was getting restless. Suddenly, inspiration struck. "I asked neighbouring passengers if they wanted to hear some Shakespeare, and no one objected," Mr Snider told me. 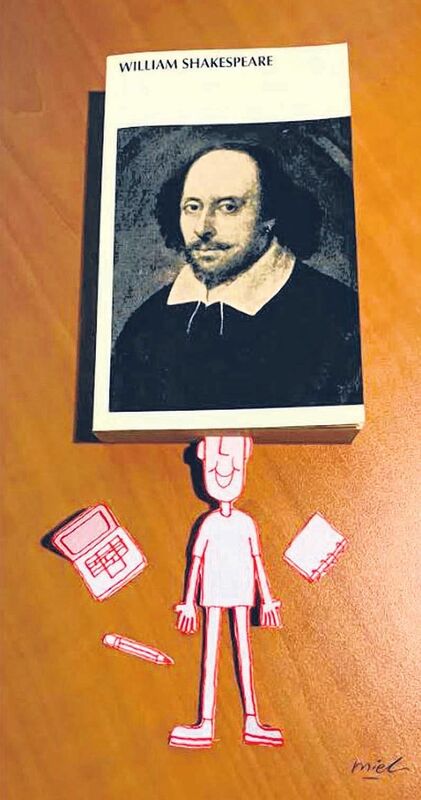 He had memorised Hamlet's "To be or not to be" speech more than 15 years earlier, to pass the time on a cross-country bike trip. "I was nervous because I'd never performed publicly before," he said. Although his jaded audience neglected to clap when he finished - they did applaud when the train started to move again - Mr Snider was pleased he didn't forget a line. The soliloquy was fixed in the architecture of his brain, ready to serve in a moment of boredom or underground anxiety. It's no coincidence that Mr Snider has asked students to memorise poetry many times in his career in education. Since ancient times, humans have memorised and recited poetry. Before the invention of writing, the only way to possess a poem was to memorise it. Long after scrolls and folios supplemented our brains, court poets, priests and wandering bards recited poetry to entertain and connect with the divine. For individuals, a poem learnt by heart could be a lifeline - to grapple with overwhelming emotion or preserve sanity amid the brutalities of prison and warfare. Yet poetry memorisation has become deeply unfashionable, an outmoded practice that many teachers and parents - not to mention students - consider boring, mindless and just plain difficult for today's classroom. Besides, who needs to memorise when our smartphones can instantly call up nearly any published poem in the universe? In fact, the value of learning literature by heart - particularly poetry - has only grown. All of us struggle with shrinking attention spans and a public sphere that is becoming a literary wasteland, bereft of sophisticated language or expressions of empathy beyond one's own Facebook bubble. For students, who seem to have less and less patience for long reading assignments, perhaps now is the time to bring back poetry memorisation. Let's capitalise on their ear for the phoney free verse of Twitter and texting and give them better words to make sense of themselves and their world. Parents have encouraged children to memorise cherished texts - Scripture, nursery rhymes, classical verse - for centuries. After the Civil War, the growth of public schools and the proliferation of textbooks with verse anthologies made poetry memorisation a fixture of American elementary and high school education. In her book Heart Beats: Everyday Life And The Memorised Poem, New York University's professor of English Catherine Robson explains that poetry recitation was an inexpensive exercise that helped even inexperienced teachers at underfunded schools impart rhetorical skills and nurture moral character. A 1902 handbook called The Teaching Of English noted that reciting poetry stocked "the mind with the priceless treasure of the noblest thoughts and feelings that have been uttered by the race". Educators and textbook publishers selected sombre poems that modelled Victorian virtues: piety, noble sacrifice and valiant acceptance of mortality. By the 1920s, educators were increasingly questioning the "relevance" of such poetry to students' lives. They began to abandon memorisation in favour of teaching methods that emphasised self-expression, although the practice remained popular until about 1960 - and still endures in some foreign language classes (to pass a college Russian course, I had to memorise some Pushkin). The truth is that memorising and reciting poetry can be a highly expressive act. And we need not return to the Victorians' narrow idea of the canon to reclaim poetry as one of the cheapest, most durable tools of moral and emotional education - whether you go in for Virgil, Li Po, Rumi or Gwendolyn Brooks (ideally, all four). How does memorising and reciting someone else's words help me express myself? I put this question to 18-year-old Samara Huggins, the winner of the 2017 national Poetry Out Loud contest, in which high school students recite poems before a panel of judges. She performed Novel, by the avant-garde 19th-century French poet Arthur Rimbaud - not an author who, at first glance, has much in common with Ms Huggins, a teenager from the Atlanta area. Understanding a good poem is hard - all the more reason to memorise it. Ask students to write a paper on Wordsworth, and once they turn it in, they consign the text to oblivion. But if they memorise his lament, years from now - perhaps while they are cleaning up their child's chocolate- smeared face after birthday cake - they may suddenly grasp his nostalgia for "Delight and liberty, the simple creed/Of Childhood" and the bittersweet truth that "Our noisy years seem moments in the being/Of the eternal Silence". "Reciting a poem will help you express what you're trying to say," she told me. "It's like when I need to pray about something, I'll look into a devotional, and those words can start me off." Ms Huggins grew up Episcopalian, but even the resolutely secular need to borrow words of supplication, anguish or thanks every now and then. Writer Susan Wise Bauer, whose best-selling home-school curriculums are based on classical and mediaeval models and stress memorisation, told me "you can't express your ineffable yearnings for a world that is not quite what you thought it was going to be until you've memorised three or four poems that give you the words to begin". She was eight years old when she learnt William Wordsworth's Ode: Intimations Of Immortality From Recollections Of Early Childhood. "Every decade I grow older, I understand a little more what he means about that sense of loss of wonder," she said. Understanding a good poem is hard - all the more reason to memorise it. Ask students to write a paper on Wordsworth, and once they turn it in, they consign the text to oblivion. But if they memorise his lament, years from now - perhaps while they are cleaning up their child's chocolate-smeared face after birthday cake - they may suddenly grasp his nostalgia for "Delight and liberty, the simple creed/Of Childhood" and the bittersweet truth that "Our noisy years seem moments in the being/Of the eternal Silence". Is it difficult to learn a poem by heart? Of course. But it is mainly a matter of diligent practice, with many pathways to success. Do you struggle with the printed page? The Poetry Foundation's website will recite poems to you over and over again, and YouTube is packed with fearless souls declaiming to the Internet. Do you dread the thought of speaking up spontaneously? You might find a memorised text empowering - as Ms Huggins, the Poetry Out Loud winner, did. "That was a hidden part of me that I didn't know I had," she said. The challenge is partly the point. When Mr Jason Jones told students in his survey of British literature at Central Connecticut State University they would have to memorise three poems of at least 20 lines each, he was prepared for groans and cries of outrage. "I was interested in messing around a little with the mutual non-aggression pact between teachers and students, the one that says, 'As long as you don't expect too much from us beyond a couple of papers, a mid-term and a final, we'll perform for you and we'll all get through this'," he told me. "I was interested in things that will bring students into closer contact with the material in the class." Colleagues teased Mr Jones about "how there'd be lines outside my door of students quietly weeping or looking like they were about to vomit", he said. "I'd stare at a copy of the poem to prompt them, or turn and look away if they wanted." In the end, he said, "their worst fears were typically not confirmed". Mr Jones didn't try to sell his students on a profound spiritual experience or practice in public speaking. Memorising a poem is just as valuable as an exercise in close reading, a chance to observe the exertions of our own brains. "When you memorise, you start to notice the things that you notice, your own habits of attention, your habits of reading," said Mr Jones, who is now the director of educational technology at Trinity College in Hartford, Connecticut. That has been my experience. Ordinarily, I am a terrible reader of poetry. I am impatient; I prefer straightforward prose that tells me what it means. But this summer, I started devoting about 10 minutes a day to memorising a few poems - one of Shakespeare's sonnets, some Gerard Manley Hopkins, some Longfellow. Every time I bumbled through a stanza, I ruminated on each word a little more. I played with tone and emphasis. "Poetry needs to be chewed over multiple times before you can begin to get what it is," Mr Snider, the subway Shakespearean, told me. I occasionally had a glimmer of consolation, too. After a day when my latest writing project felt pointless, I was running a fever and found myself kneeling on the kitchen floor at 9pm scraping at ossified bits of my toddler's morning oatmeal with the edge of a spoon. I was ready to "trouble deaf heaven with my bootless cries". Shakespeare just gets me. It's time for us to show we care about words again, to rebuild our connection to a human civilisation so much broader than our Twitter feeds. Start a poetry club with friends and find a few pearls in John Hollander's Committed To Memory: 100 Best Poems To Memorise. Read Caroline Kennedy's Poems To Learn By Heart with your kids.